The trig. point. marks the fell top. 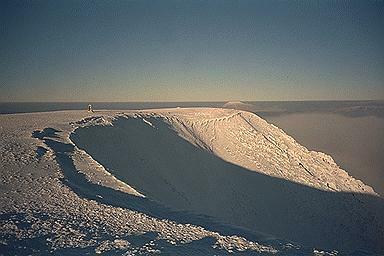 Swirral Edge is seen in profile on the right of the picture. In the distance, beyond the crest of the Edge, is Skiddaw. Banks of cloud were rising rapidly from the east and soon immersed the writer, making photography pointless for the rest of the day. A Brocken spectre, witnessed when overlooking Brown Cove, proved unphotographable. A monument slightly to the south of the summit shelter commemorates the landing here in 1926 of a plane, an Avro Alpha. The pilot took off shortly after, having asked directions. Larger version of this picture.